If you thought that Thule makes only jogging strollers, you will be really surprised with their new model prepared for 2018. Thule Sleek is designed for city adventurers! It’s not only multi-functional and flexible, but also stylish and chic. Keep reading and you’ll see what assets and drawbacks I found on Thule Sleek. Convertible and expandable strollers are getting really popular nowadays. Not only Nuna has released their first stroller that expands from single to a double. Thule also designed their first expandable stroller which comes out in 2018. It’s also Thule first four-wheel stroller! Thule Sleek combines functionality and elegance. The light and modern design is perfect for urban parents. This stroller is easy to steer to help parents move around the city jungle and comfortable for the little passengers as well. Psst! If you are looking for a stroller that can be used from infancy to toddlerhood with different seats for one child check out my list of 9 best convertible strollers of 2019. If you need a stroller that expands for the second child you may want to see my favorite single-to-double models. As every other convertible and expandable stroller, this one also gives parents flexibility to attach different seats to the frame, depending on family needs. Below you can see the different seating options in single and double mode. 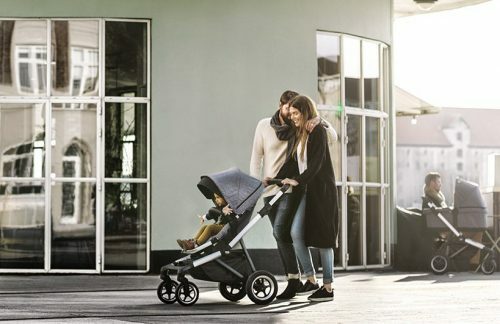 Thule knows that every family is different and has different needs, that’s why their new stroller – Thule Sleek grows with the family and adjust to its changing needs. Parents can use many seating options and create their own Thule Sleek just like they want. In the basic mode this stroller comes with regular toddler seat which is reversible and equipped with 3-position recline. Because this is a bucket-style seat and it is still few degrees reclined even in the lowest position, I’d recommend using it from at least 3 months, when the baby has better neck control (you can also add an insert or body pillow for proper support for your little one). Great thing is that the recline is one-handed. There is a lever on the back of the seat which you need to use to lower or raise it. What I really like about this stroller is the upright position – it’s pretty up, which is perfect for curious toddler. Such a straight upright position is really rare, especially among everyday strollers. Big plus for Thule Sleek! There is also a leg rest that can be adjusted separately as the baby grows. Very useful feature. The seat is equipped with comfy and soft padding that is completely removable and washable. There is also adjustable 5-point harness with padded straps. Another advantage is the included bumper bar that can be open from both sides so parents can have easy access to their baby. The regular seat has capacity of 48.5 lbs. Keep in mind that the sibling seat has smaller weight limit – 33 lbs. It’s very similar to UPPAbaby VISTA. You can check the sibling seat color versions and price on PishPosh Baby. On many websites you can find incorrect information that both seats have capacity of 75 lbs (150 lbs of total stroller capacity). The brand lately confirmed the weight limit of 48.5 lbs and 33 lbs, for the regular and sibling seat respectively. There is also option of attaching a bassinet to the stroller frame, so parents can make it suitable for their newborn baby (check the bassinet price here). The canopy with UPF 50+ material and apron protect infant from the sun and wind really well. The sunshade is adjustable, has sun visor and mesh panel that opens with a zipper. The weight limit for the bassinet is 19.5 lbs. It will be available in 5 color versions: red, black, navy, grey mélange and dark grey. Thule understands that urban parents often drive with their kids and knows that car seat compatibility is a must-have feature in a stroller. That’s why the new Thule Sleek can be also turned into a travel system as it is compatible with infant car seats. Sleek can accommodate two infant car seats, you just need to purchase special adapters separately. At the beginning there will be adapters for Chicco and Maxi-Cosi car seats (these will be available in September but you can already pre-order them! Here’s Chicco adapter and here’s Maxi-Coxi adapter). Parents can expand Thule Sleek to a double tandem stroller and add bassinet, infant car seat or sibling seat. It is perfect option for kids with small age different (for example newborn + toddler). 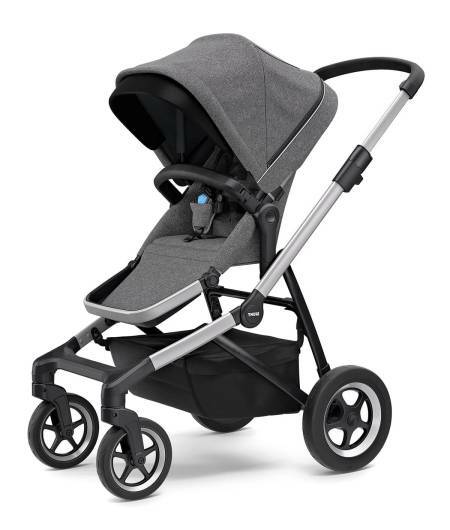 If you plan on having second child shortly after the first one Thule Sleek Stroller may be just what you need. I love the fact that this stroller comes with upper seat adapters, so you don’t have to spend extra money on this accessory! Oh and there’s one more thing. When you convert this stroller to a double the upper seat goes even more up and it’s really close to the parent. It’s really great features, especially if you have two kids of different age, because you can keep your youngest one closer to you. It also helps you to interact and bond with your baby. And thanks to awesome design this upper seat canopy won’t cover the handlebar. Pushing Thule Sleek is always hassle-free. As you can see this stroller really grows with the baby and adjust to expanding family. Parents can start using it from birth with the bassinet or infant car seat. As the baby grows and develops neck control, you can switch to the regular, toddler seat. And when the second child arrives, you can add bassinet, infant car seat or second toddler seat. Thule Sleek allow you to add a board for the third, older child where he can stand during the stroll. It’s great option if you have older toddler or a preschooler. The regular seat has good-sized canopy with a sun visor. Thanks to it your child will be protected from sun, wind and rain, while also being protected from overheating since there is a zippered mesh part of the canopy. The sun visor can be folded away or unzipped when not in use. There is also silent peek-a-boo window with magnetic closure so you can easily check on your baby during strolling without waking him up. Great thing about this canopy is that you can slide it up as the baby gets taller, giving your baby even more room to grow. Thule has thought about everything! The handlebar can be adjusted to different heights to provide comfortable pushing for shorter and taller parents. There is 8.5 inches of adjustability. The push bar telescopes in and out which is awesome because it gives taller parents more space behind the stroller so they don’t kick the rear axle and wheels. Thule Sleek has quite big wheels: 11” in the back and 8” in the front. Tires are rubberized and filled with foam – no worries about punctures. The wheels are durable and resistant to abrasion. Front wheels are pivoting to make the stroller more nimble and easier to maneuver even in tight turns and even with two kids. Parents can also lock them to increase stability when they are going over rougher terrain, like gravel or grass. The wheels have one more awesome feature: they have a reflective rims to keep you and your baby visible and safe during morning or evening strolls. Each wheel has independent suspension which provides comfortable ride, even when going over cobbled street or gravel. This expandable stroller has single action brake, placed in the middle of the rear axle. The pedal it quite big which makes it easy to press and lift. Thule Sleek offer really nice storage basket under the seat. This bin closes with a zipper to protect your belongings from falling out or from the rain. Besides, when you fold the stroller, you stuff won’t fall out! And even when the basket is zippered, you have the quick access to it because the rear part extends and closes with magnets. It’s really smart solution, that you don’t have to unzip the basket to take out your gear. This bin can hold about 11 lbs. And if this basket is not enough for your gear, you can always add another storage bag and attach it to the stroller frame, right behind the basket. Usually tandem double strollers are heavy and long which makes them hard to lift and difficult to steer. With expandable stroller it’s different. This type of strollers is shorter, because the frame has the same size in single and double mode. Thule Sleek is an example of that. It’s not as long as standard tandem stroller, so parents can easily push and turn it. But of course with two seats attached it is more bulky than single stroller. So taking Thule Sleek double to a small grocery store or restaurant is probably not the best idea. Now let’s talk about the weight. The chassis is really lightweight, as it is made of aluminum. So the stroller is pretty easy to carry, especially when the seat is detached. With one toddler seat Thule Sleek weighs 28 lbs which is a decent weight for such a multi-functional and convertible stroller. Going over curbs won’t be a problem. But for some parents it may be quite heavy to carry up and down the stairs or to lift to the car trunk. To fold the stroller you just need to pull two triggers placed on both sides of the handlebar and it collapses immediately. It’s very easy to do, takes few seconds and the stroller is quite compact after folding. What’s really great is that you can fold it with or without the seat. However, keep in mind that the stroller is easier to transport and store when the seat is detached. Parents can really customize their Thule Sleek and adjust it to their needs, thanks to wide variety of accessories (sold separately). There will be the sibling seat, bassinet, car seat adapters, travel bag, parent cup holder and child tray available for Thule Sleek 2018. The new stroller from Thule will be available in 5 different colors, each of them looks very elegant and chic. Here are the color versions for Thule Sleek: Grey Mélange, Midnight Black, Shadow Grey, Navy Blue and Energy Red. If you’d like to compare prices for different colors you can do it on PishPosh or on Amazon. Thule Sleek release date was scheduled for August 2018 and you can already order it on PishPosh Baby. Below you can check prices for all parts! As other strollers from Thule this model won’t be cheap (the price will be similar to UPPAbaby VISTA and NUNA Demi Grow). But the quality is worth the money. The additional seating options like bassinet or sibling seat will be sold separately. This stroller is design for city dwellers who want to share their urban excursions with their kids. It’s perfect option for parents who have one child but plan on having second baby soon or already have two kids. The stroller has nice balance so it can be used not only for twins, but also for a newborn and older toddler. Thule Sleek is great choice for parents who want to run errands or go shopping with their babies and sometimes like to go for an off-road trip. Thanks to awesome wheels and suspension this stroller can handle many types of terrain. And with nicely padded reclining seat and good-sized canopy it’s super comfortable for the child. 2018 has been really awesome! 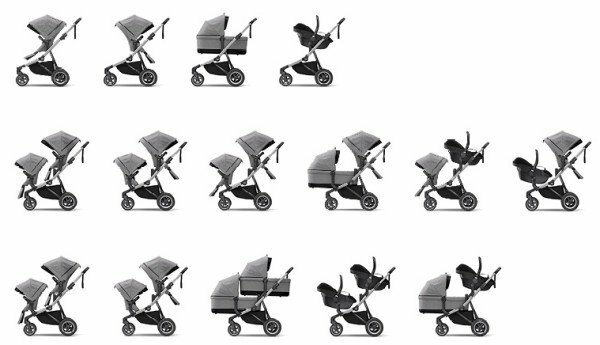 There are so many new strollers that came out in 2018. Manufacturers prepared plenty new models that were really worth waiting for and Thule Sleek is definitely one of them. If this stroller is not what your family needs, I invite you to read my ranking of 25 exceptional strollers currently available on the market – in this article. Do you need to buy the upper/lower adapter set for the sibling seat if you want to initially have a carseat (with appropriate adapters) at the top position and the toddler seat on the bottom? From my understanding only upper adapters are included? Also, if buying a separate toddler seat down the road, does that one have to go in a certain position (meaning, since it has a lower weight capacity, it should go lower or higher)? Thank you. Hi! Any idea how this stroller would handle in the snow? I have a few questions about this particular stroller one being is the only car seats adapters for Chicco and Maxi-Cosi car seats or could one use a Nuna car seat or does it have be only those particular car seats? my other question is in regards to the sleek stroller is how is it in sand, grass gravel areas and could it be used for jogging on smoother ground or is it mainly designed for walks, grocery store trips? Chicco Adapter allow you to attach KeyFit, KeyFit 30 and Fit2. Thule Sleek is not designed for jogging, it doesn’t have pumped tires and with four wheels it would be less maneuverable during jogging.